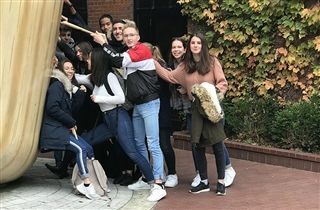 On November 2, KCD welcomed 12 students and two teachers from our exchange school in Clermont-Ferrand, France. The group has had a wonderful time in Louisville, touring our wonderful city and visiting with students and teachers on our campus. Over the past week, our guests have visited several local landmarks including Churchill Downs, the Louisville Slugger Museum, 21c Museum Hotel, and the Evan Williams Distillery. Our guests have also attended classes, toured our campus, and met with students, faculty and staff. We would like to thank Donna Tatum-Johns and Sarah Moran for organizing this visit and these activities for our guests. In addition, we’d like to thank our host families for making our guests feel welcome during their time in Louisville!